What occurs during laparoscopic gastric bypass? Roux-en-Y Gastric Bypass works by temporarily decreasing hunger and cravings, restricting the amount of food you can eat at one time and reducing the absorption of calories. The Roux-en-Y Gastric Bypass is considered by many experts to be the current gold standard procedure for bariatric surgery. Although the surgery is typically not reversible, it is the most popular form of bariatric surgery. This procedure is widely viewed as a safe and the most effective means of achieving long-term weight loss in patients who suffer severe obesity. Laparoscopic Roux-en-Y gastric bypass was introduced approximately twenty years ago and over the years has demonstrated an excellent balance of weight loss and side effects that are manageable. 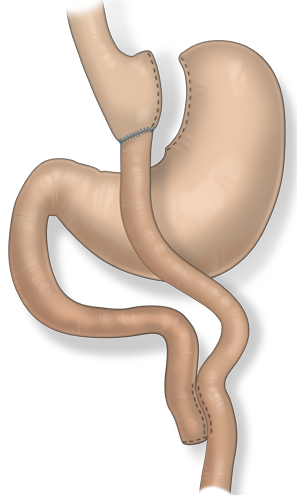 In this surgery, the stomach is sewn or stapled to create a smaller stomach pouch that can hold only hold about a half-cup of food. The idea behind the pouch is that an individual feels full more quickly with a smaller stomach, and thus eats less. This is called the restrictive part of laparoscopic gastric surgery, as it restricts food intake. In the bypass part of the surgery, the small stomach pouch is disconnected from the first part of the small intestine, called the duodenum, and then reconnected to a portion of the small intestine further downstream, called the jejunum. The fact that the intestines are changed from their natural route to the shape of a Y is called a roux-en-Y intestinal bypass. Once in place, food passes from the stomach pouch directly into the jejunum, bypassing the duodenum and a portion of the intestines. Because part of the small intestine is bypassed, there is reduced absorption of calories and nutrients. This accounts for this portion of the operation being classified as malabsorptive. Like other laparoscopic operations, the laparoscopic gastric bypass is performed using a tiny camera called a laparoscope and requires only a few small incisions on the abdominal wall. The laparoscopic approach is popular because of improved visualization, less pain, minimal blood loss, quicker recovery, and lower risk of complications such as infection or hernia. Gastric bypass surgery requires a stay in the hospital. It is performed while you are asleep under general anesthesia which means you will not experience any pain during the surgery. The operation usually lasts one to three hours and has a typical hospital stay of two to three days. This statistic depends on a number of factors including whether or not an individual has had a previous abdominal operation, the persons gender and the BMI. Laparoscopic Gastric Bypass is a different operation than the Lap-Band and the laparoscopic gastric sleeve. Although the incisions are similar, there are many physiological differences between the three operations. Those who undergo laparoscopic gastric bypass start losing weight quickly after the surgery. Weight loss is marked and lasts about one and a half years. After that period of time, the body compensates for the surgery and weight loss stops. Patients typically stay in the hospital between one and three days after a Laparoscopic Gastric Bypass. The criteria that determine when a patient is ready to return home include being able to drink a certain amount of liquid each hour and no longer needing any injectable pain medications. A typical post-gastric bypass diet consists of liquid and pureed food for a few weeks after surgery. Immediately after the surgery, patients feel full quickly because the stomach will only be able to hold a tablespoon of food. The reason for this temporary change in diet is that the connection that the surgeon creates between the stomach pouch and the intestine swells after surgery. This swollen connection causes the food that is in the stapled part of the stomach to pass at a slow rate. This change is temporary and once all the healing and swelling is complete, the stomach will be able to hold a maximum of one half-cup of thoroughly chewed food. Sometimes gastric bypass can cause dumping syndrome, which occurs when food moves too quickly through the stomach and intestines. This results in weakness, nausea, a feeling of faintness, sweating and perhaps diarrhea after eating. Eating highly refined sugars and high calorie foods aggravates this condition, which may require lying down until the symptoms pass. Dumping syndrome can be viewed as a benefit of the operation because it can stop patients from eating high calorie foods. After the surgery, it is important to maintain healthy lifestyle changes, such as a strict diet and an exercise regime. Laparoscopic gastric bypass is meant as a means to a healthier and long-lasting life, which requires dedication and hard-work. It is very important that patients considering bariatric surgery spend the time to speak to others who have had the surgery. Although doctors can predict some of the body changes that occur after this surgery, there are many emotional and lifestyle changes that occur with bariatric surgery that only someone who has had the surgery can understand and explain. As is the case with all surgery, there are risks associated with gastric bypass. They include an infection at the site of the incision, a leak from the stomach to the abdominal cavity or from the intestinal connection and a blood clot that can travel to the lung. 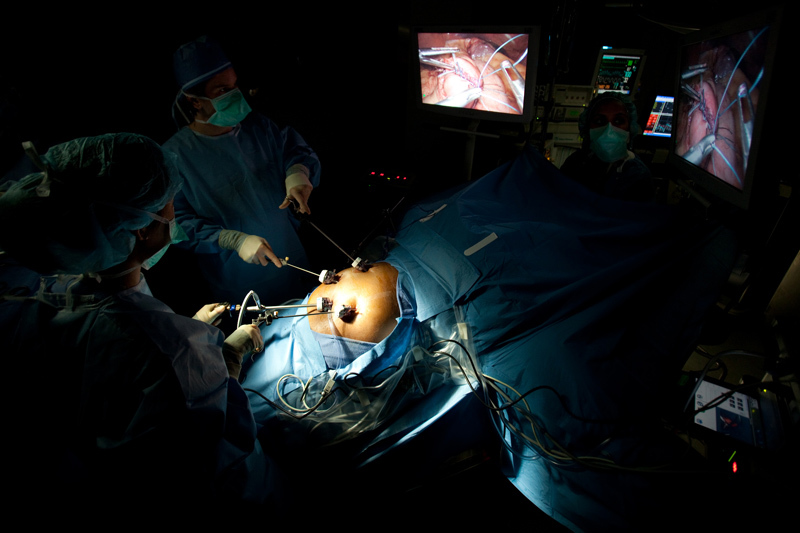 Laparoscopic weight-loss surgery involves some degree of risk. The procedures are performed under general anesthesia and usually last for between one and three hours. Frequent follow up with Dr. Belsley in the first year after the surgery and on a regular basis from that period forward is important to the success of the surgery. Dr. Belsley works with a dietician to provide you with the appropriate recommendations to make surgery a continued success. All patients must take vitamin supplements after the laparoscopic gastric bypass. This regime may be tailored by checking vitamin levels periodically. Roux-en-Y gastric bypass usually results in more immediate and robust weight loss than other restrictive surgeries and is more effective in reversing the health problems associated with severe obesity.